The legal way to convert iTunes DRM protected files to unprotected music files on Mac OS X. AppleMacSoft DRM Converter for Mac is a perfect solution for people who purchase their music, audiobooks and video from iTunes Store but have compatibility issues with their mobile devices. This application can bypass iTunes DRM-protection and is able to convert iTunes M4P, AAC, AAX, M4B files to regular audio formats including MP3, M4A, M4R, MKA, AAC, AC3, AIFF, AU, and FLAC ready for using on any other computer or digital music device such as iPhone, iPad, HTC, PSP, tablets, smartphones, Walkman, and car MP3 CD players, etc. It can quickly extract audio tracks from iTunes DRM video (M4V or MP4) files and save in all popular audio formats with CD quality at 16X high speed. Of course, It can allow you to convert DRM iTunes files and audiobooks as the same. With it advanced DRM-removal technique, you can convert any iTunes protected music without any restriction. Export audio files for playback on any portable device. The only legal way provided for you to remove DRM from iTunes M4P, M4B, M4V, M4A, AAC, AAX files. Support customizing output file names. 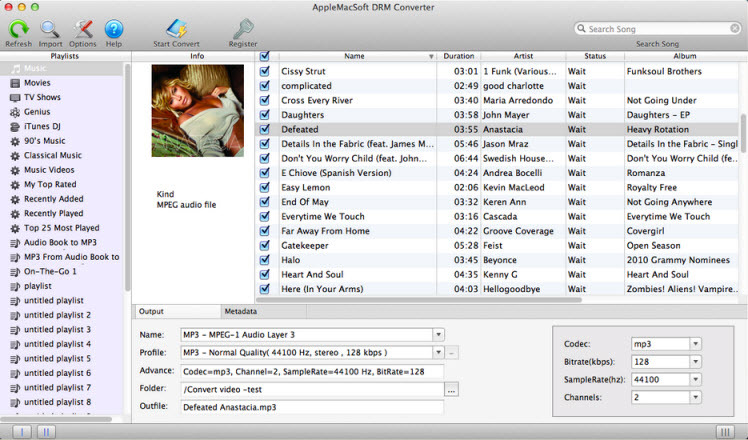 Preserves ID3 tags for song names, artist, album, artworks, etc in MP3 and M4A output files after conversion. Adjust advanced audio parameters like encoder bit rate, sample rate, codec, and audio channel to optimize your music conversion. Convenient search function even scans your iTunes for any media files to be processed. Specially designed for Mac users and fully compatible with Mac Mountain Lion and Mavericks. M4P converting is very simple and the software interface is user-friendly. All future updates are free to all registered users. It won't install any virtual drive, and needn't any extra hardware. No matter what happens, your original music will not be harmed in any way. Free technical support is available for every user. 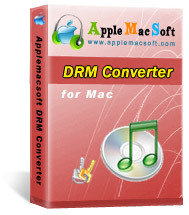 Open your Applications folder and Right click on AppleMacSoft DRM Converter then choose Open at the first time you want to run this software. Select iTunes music, You can choose more than one. Choose output format and Output Folder (optional) in the bottom of the main window. After all the settings, click "Convert" and begin to convert iTunes music on Mac. Easily convert iTunes M4P, M4B, M4V, MP4, AAX, and audio books to unprotected MP3, AAC, AC3, AIFF, M4A, M4R, and MKA formats on Mac OS X. Convert protected music M4P, MP4, AAC, WMA, MP3 to unprotected formats WMA, MP3, OGG. Easily convert protected music files wma, m4p, mp4, aac, mp3, wav, ogg, rax, ra, aa, snd, aif, audio books etc. to unprotected MP3, CD, iPod.